Summary: Theresa May wants us to believe she is the only one who can deliver a successful Brexit deal. When we look at her track record it is clear that she is utterly unsuited to this. She has a dreadful reputation amongst colleagues as being very hard to work with and completely unable to demonstrate the flexibility that one needs when carrying out any of these negotiations. Her track record as Home Secretary is awful yet she has managed to airbrush so much of that out of existence. But we must make sure that track record is exposed. It is clear that she is a fraud, totally unsuitable for carrying out successful Brexit negotiations. Theresa May is trying to move the election conversation back onto Brexit because she claims to be the only one who can deliver the best for the UK. Unfortunately, all the evidence suggests she has little chance of succeeding. Her track record as Home Secretary for six years is appalling. Remarkably little was achieved and she managed to deflect blame onto others when things went wrong as they did so often. Dealing with the EU on Brexit is going to be challenging. Theresa May believes she can simply “make a deal”, a phrase reminiscent of Donald Trump. The EU are treating the negotiations as a chess game with a kaleidoscope of complex and interconnected moves. They can now be sure that if they come across something that they simply cannot accept that she will cave in just as she has done on the Dementia Tax, increasing self-employed national insurance and many other things. An article in the Daily Telegraph (see: https://order-order.com/2016/07/02/read-full-article-pulled-telegraph-pressure-may-campaign/) was pulled almost at once following pressure from her campaign office but it is remarkably revealing about her approach to power and responsibility. Her reputation amongst Cabinet colleagues is dreadful. In committee she is arrogant and rude and very short on either strong negotiation skills or the ability to win allies. Absolutely the wrong combination to negotiate with the 27 nations of EU, the majority of whom want this all to go well. The best known failure for Theresa May is her complete inability to make the slightest mark on the immigration numbers over seven years. Those years have had a consistent target of bringing immigration below 100,000. Again she has written this into the Tory manifesto. Many other failures have been glossed over while Theresa’s reputation has been burnished. The protection of our borders is laughable. Not only are small airfields completely un-regulated and un-controlled. The UK has three vessels patrolling 7700 miles of coastline. Italy has only 4700 miles of coastline but it does have 600 vessels. Then there was the collapse of the eBorders IT system (cost about £1 billion), her failure to establish exit checks on all the country’s airports and ports (due by March 2015). Nothing much was done in protecting girls from ethnic minorities from FGM and forced marriages. The list of disasters that happened under her watch just goes on and on. Incredibly she has managed to sail past the wreckage of so many initiatives that foundered through her inattention. This is a manifesto that has not been created in consultation with members of Cabinet, or other Tory politicians with a good ear for what will go down with the voters. There is an extraordinary arrogance in writing this yourself with a couple of close advisers. And then simply putting virtually not one single number in the manifesto (apart from the Dementia Tax limit) is completely stupid particularly as Tory strategy in fighting Labour is to say “nothing has been costed”. Indeed on the Jeremy Paxman show on Channel 4 on 29 May the audience heckled and jeered her when she said the Labour sums don’t add up. The Tory sums add up just because there aren’t any, not one. The only thing that does not add up is her ability to carry out sensible Brexit negotiations. 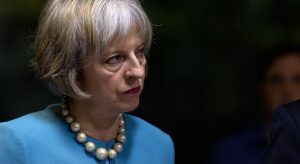 She has been described by a cabinet colleague as secretive, rigid, controlling and even vengeful to an extent that colleagues from both parties dreaded meeting with her about anything. That is completely not who should be leading our Brexit negotiations and it is this fraud that she is trying to perpetrate that must be resisted in the run-up to June 8.